Lunch is not all pasta with potatoes here in the Eternal City. 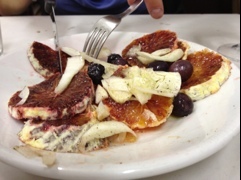 I have seen this dish with oranges and olives, dressed with oil, for years — both here in Roma and in the states. I am not sure whether it is of Roman origins or not — so much of what one eats in this country is specific “tipico” to its region. I have admittedly seen some variance to that on this trip. Just like it used to be you couldn’t even order a cappuccino after noon but now you can — other regions’ foods are popping up here. 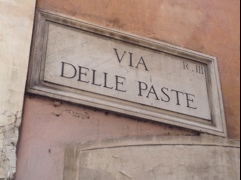 I have seen pasta with pesto at a couple of trattorie this week — pesto is from Genoa, not Rome. I would be curious to see if that kind of regional culinary mixing happens in smaller towns or just in this sprawling metropolis. While eating my “don’t leave Rome without (eating) it” cacio e pepe pasta dish at my favorite Roman restaurant Soro Margherita, I decided, finally, to order the orange salad. Important to note, that any salad or veg dish (it may be oranges but this is no dessert) is served after the primo (first course) of usually pasta, rice, or gnocchi and the (second course) secondo. 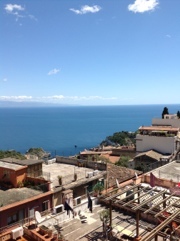 That baffled me when I was first visiting Italy. This truth had not yet come up in my guide books. I would go to a restaurant, order pasta with (what I thought was going to be a side of) a vegetable. Watch my pasta get cold (okay, so I didn’t wait!) wondering “where’s my broccoli”? Sometimes even, I would ask the waiter to cancel the veg because I was full, dammit! I digress. As I am wont to do. This simple orange salad was ambrosia! The oranges, blood oranges, were just the perfect mix of tart and sweet, so juicy that one bite caused an explosion of the most delicate and succulent tastes on the tongue and, if you weren’t careful, down the chin. The salad was dressed with a light, fruity but not intensely so, olive oil. The juice mixed with it to make a simple dressing. Sprinkled lightly in the dish, just the perfect grind of black pepper (not sure what the story is with the pepper here, if they roast it, or if it is farmed from somewhere else in the world than we are used to, but it is very special). They top the salad with perfectly sliced, crisp fennel and a small handful of mixed black olives. Simplice but squisito! It was truly the food of gods. My dining companion tells me that it is the antidote to the pasta and deep-fried artichoke carciofi alla Giudia we had consumed. Eat this orange and fennel wonder, and it erases the fat and calories of anything you ate before it. Lest you think I only eat thinly disguised donuts that don’t seem like they’re donuts because they have names I can’t recall — here is my porta via (take out) dinner purchased at a pizza/forno (bakery) in Monti. 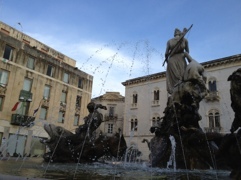 The turisti are all out in the piazzas now, or at the wine bars, or having those little glasses of nuts and chips & plates of savories with their glasses o’ wine (read Apertivi Time in Rome). There were only Italians in this pizza joint, working folks, grabbing a little slab of pizza like me. 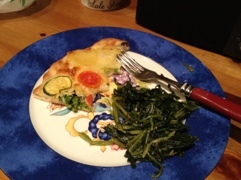 I walked away with veggie pizza with a slice of potato tossed on — and then oh those greens! Why are they so damn good!?! I make them at home. They dont taste like this. Granted, I don’t see those water tubs with stalky greens floating in them that seem ubiquitous in every shop or super mercado I have visited. I went with cicoria (chicory) tonight. Alas, I think the punterelle season is over. Now, don’t get me wrong, this is not all I do while in Rome: eating. I have been museuming, churching, praying, monumenting, Pantheoning, Coliseuming. Walking, walking, walking. It’s that food as microcosm thing at play. The way a culture does their food is the way they live and think. Hey, better minds than mine have pondered this. People you might say who are higher on the food chain. But, the Italians express themselves with those plates of bitter greens yanked from the ground. And, by the way, those Roman greens are nothing like the ones in Florence. Or, Assissi. I ran into a funny blog written by an Italian in America when looking for the name of that killer sweet I had for breakfast. The writing is in Italian, but you get the drift with the pictures. This hapless soul looked into the face of Taco Bell coffee and a Hearty Man breakfast of bacon, eggs, hash browns, pancakes and toast. When all he wanted was un caffè e un cornetto. 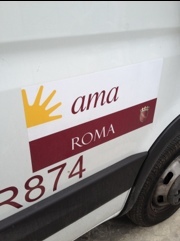 Ama Roma appears to be the new saying for la Bella città. Love Rome. And, really, how could you not. At this morning’s breakfast ritual, with my cappuccino (pronounced copp-ew-CHEEN-oh) I picked a pastry larger than my hand. Hell, larger than that graphic hand on the side of the Roman city truck. I loved that pastry. I’m glad I chose it (although at that size, it probably chose me). I should never be allowed to order it again. It was the flakiest kind of pastry, covered all over with the lightest of sugar glazes, filled with just enough — abbastanza— cream. Sprinkled with a dusting of powdered sugar. Then, placed into the case for this hapless traveller. I didn’t see any locals in that coffee bar eating the hand-sized pastry with their copp-ew-CHEEN-oh. I asked what it was called. I heard pasta and alla Romana. 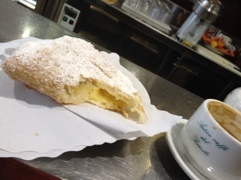 I think I’ve read about this legendary pastry, typical, only in Rome. As I walked out, I did see more pastries that looked like it. Just smaller. Hmmmm….